"Reggie will be speaking at the D.I.C.E. summit at 10:30 a.m., February 9th. Reggie’s speech is entitled “Expanding the Market for Interactive Entertainment” and will last for 45 minutes. Nintendo Power is telling everyone to remember this date, and make sure to check out Nintendo.com. Will we be seeing some new Revolution details? Perhaps a brand new Twilight Princess trailer? 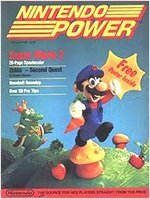 All I know is that if Nintendo Power is telling us to pay attention to Nintendo.com, I will be there all day." Great news! Mark your callendars!